Sew what's cooking with Joan! 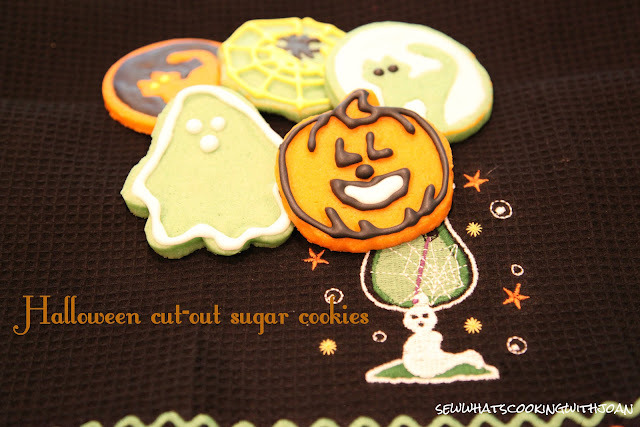 : Spiders, Pumpkins and Spooky Ghosts! 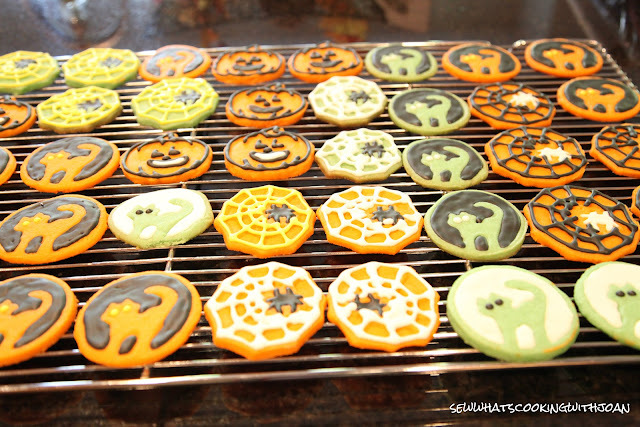 As Halloween quickly approaches, I have a cookie recipe to share with you. I found these cookie cutters at Williams Sonoma and decided to bake, decorate and box up in cute decorative boxes and deliver to our neighbors. 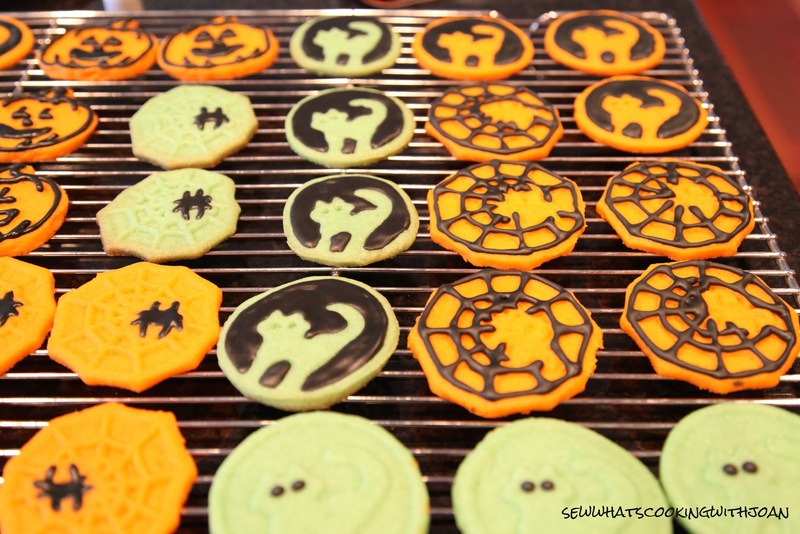 These cutters are great for beginner cookie decorators (like me!) because it stamps the design on the cookie so that you know where to decorate! They have taken all the guess work out of it. Well, I suppose you could say that they have taken all the credit for the design. I haven't mustered up the courage yet to bake a batch of cookies and decorate myself, so these were perfect for me as a first attempt into the cookie decorating arena! These cutters are exclusive to Williams Sonoma and you still might find them in stores as I did -I got mine on sale! If you would like, you can buy cookie cutters in the same shapes and just use these designs as a template to make your own from scratch. Have all the ingredients at room temperature. Over a small bowl sift together the flour and salt. Set aside. In the bowl of an electric mixer fitted with the flat beater, beat the butter on high speed until creamy, about 2 minutes. Reduce the speed to medium , slowly add the sugar and beat until light and fluffy, about 2 minutes, stopping the mixer occasionally to scrape down the sides of the bowl. Add the egg and vanilla and beat for 1 minute, stopping the mixer once to scrape down the sides of the bowl. Stop the mixer and add half the flour mixture. Beat on low speed until most of the flour has been absorbed, about 1 minute. Add the remaining flour and continue beating until all of the flour has been absorbed and the dough starts to pull away from the sides of the bowl, about 2-3 minutes. Turn the dough out onto a work surface and divide into 2 equal balls. Shape each into a disc and wrap separately in plastic wrap. Refrigerate at least 2 hours or up to 2 days. Remove the dough from the refrigerator and let stand for 10 minutes. 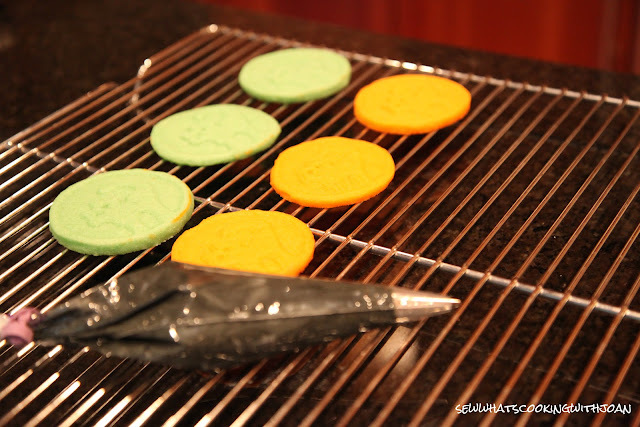 Once the dough as been out of the fridge for 10 minutes, I used food coloring gel to color my dough green and orange. Preheat oven to 350F. Line several baking sheets with silicon mats or parchment paper. On a lightly floured surface (or on a silicon mat) roll out the dough and then use your cookie cutters to cut out desired shapes. If you find that the dough is sticking to the cutters, simply dip the cutter into some flour before cutting out more shapes. Using a small offset spatula, transfer the cookies to the prepared baking sheets, spacing the cookies about 1-inch apart. Re-roll the scrapes and cut-out more cookies! Bake the cookies until golden brown around the edges, 7 to 10 minutes for smaller shapes and 12 to 16 for larger shapes. If you are baking more than one sheet at a time, rotate the baking sheets from top to bottom halfway through baking. 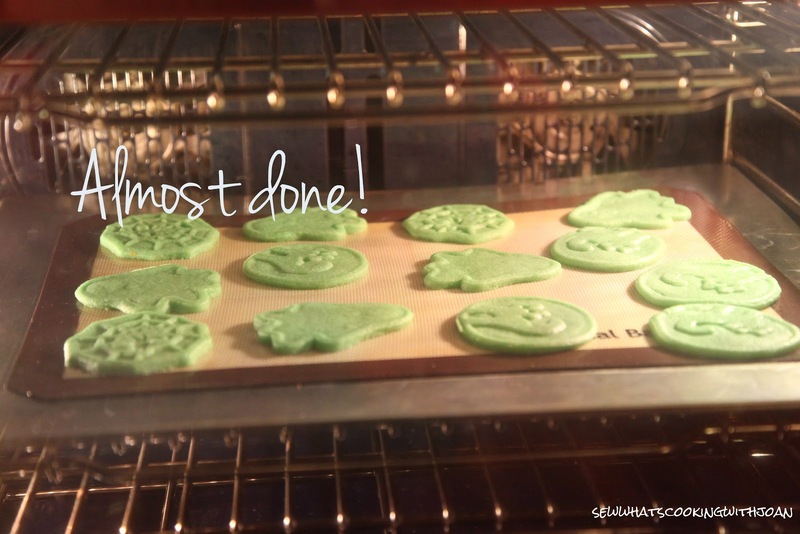 Once done, transfer the baking sheets to wire racks and let cool for 5 minutes, then transfer the cookies to the racks and let cool completely. This recipe makes about 45-50 cookies. Once I made the batch of icing, I separated the icing into different bowls and colored them multiple colors (I use Americolor gel). The batch of icing I made was more than enough to ice the 45-50 cookies. Beat all ingredients until stiff peaks form. Make sure all bowls and utensils are grease-free or your icing will never reach proper consistency. You may add additional water to reach the consistency you desire. For me, I was looking for a consistency of corn syrup so I added a couple more teaspoons of water. Start with 1 teaspoon and gradually add more if needed. Using a #2 or #3 size tip, fill pastry bags with icing and start outlining and filling in your cookies. If you are going to outline a cookie and then want to fill it in with a different color icing, you want to let the outline dry for about 30 minutes before going back to fill in. This ensures that the icing you use to fill-in does not bleed into icing you used to outline. If you are using the same color to outline and fill-in, you don't need to wait. 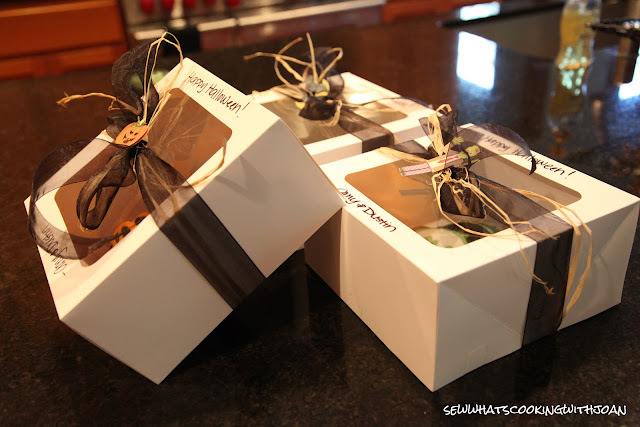 I purchased cookie boxes at Micheal's and used black satin ribbon and natural colored raffia (also purchased at Micheal's) to tie around the box. Wishing everyone a fun and safe Halloween! 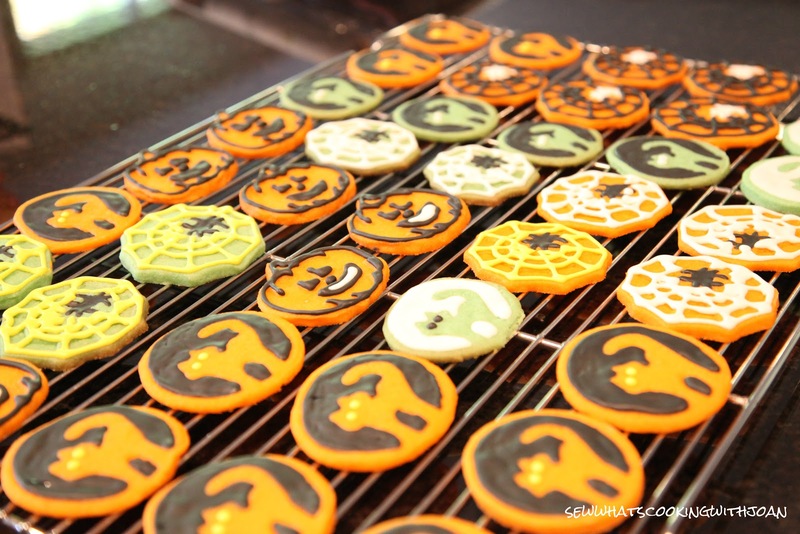 Thanks for letting me share my cookie making with you and hope it inspires you to get into the kitchen and make some spooky treats. Right NOW! I am wanting to live in your neighborhood!! 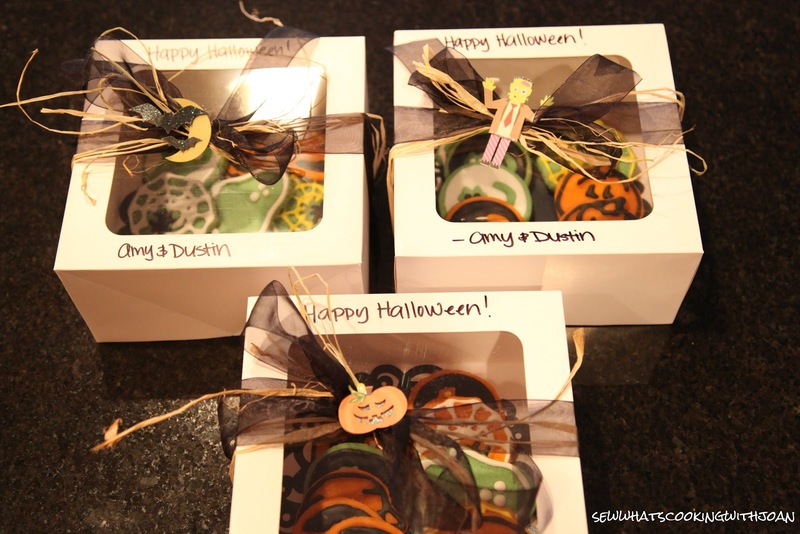 Mmmmmm those look so yummy and are so festive for the kiddo's!! Great blog Sweet One!! These cookies are so cute, Amy! I wish I lived in your neighborhood, too! 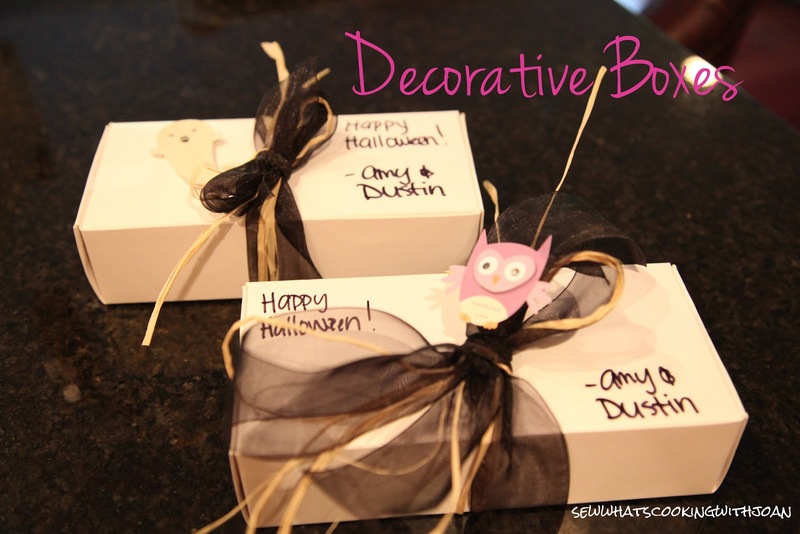 I love the ribbon and Halloween tags that you put on the boxes, also.